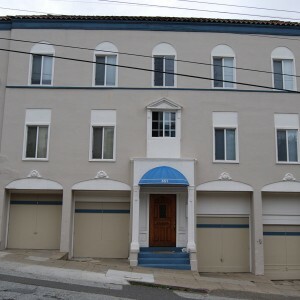 22,000 Oakland rental units are in potentially soft story buildings. Severe damage or destruction to these units could result in personal injury, damage to possessions, loss of housing and potential loss of life for tenants, and property damage and loss of rental income to owners. What is a Soft Story Apartment? 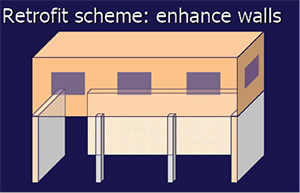 Only buildings with 5 or more units will be eligible to participate under the Safer Housing for Oakland seismic retrofit grant program for Multi-Family Residences. However, owners of soft-story apartment buildings with less than 5 units may voluntarily participate. Click here to use an online tool to see if your building is at-risk. 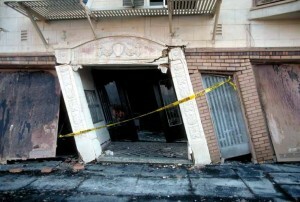 What Does a Seismic Retrofit to a Soft Story Building Entail? 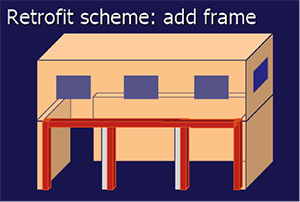 Typical retrofits may include additional plywood sheathing the exterior walls and interior partitions, steel frames to be added at the open side of the building and perhaps at interior wall lines and any necessary foundation elements to support the new steel frames. See graphics at right. Softens the economic blow of a major disaster.